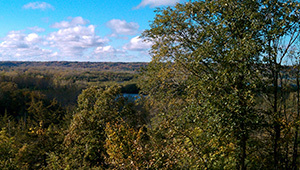 For years, local conservationists have been trying to protect the open space in Scott County known as Blakeley Bluffs. This 128-acre area with large swaths of forest and blufflands with stunning views borders the Minnesota River—a major tributary of the Mississippi. The Trust for Public Land worked with the state Department of Natural Resources to protect this land as an addition to the Ney Wildlife Management Area. This ensures the river's water quality is protected and public access to a beautiful natural area for hiking, kayaking, hunting, and camping is provided. Funding for this project was provided by the Outdoor Heritage Fund as recommended by the Lessard- Sams Outdoor Heritage Council.